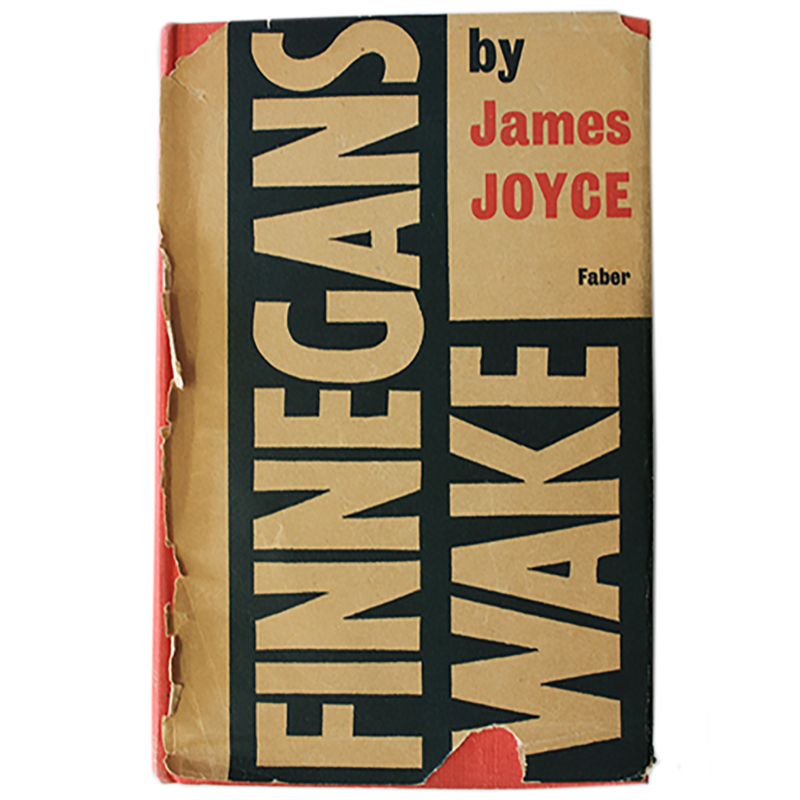 Finnegans Wake, Joyce’s final work, was created over a period of sixteen years with composition starting in 1923. It was finally completed and published in May 1939. Like all of Joyce’s works Finnegans Wake was dogged by publication controversy. The obscurity of the text meant that many lost faith in his last artistic venture, finding it too cryptic to relate to. In the end it was his own innate belief in his artistic mission and the support of a number of close allies that carried him through to complete the work. The title came from the popular Irish ballad about a hod carrier (brick transporter in the construction industry of the time) called Finnegan, who falls to a supposed death from a building but is revived by a shot of whisky which is thrown in the drunken mêlée that ensues at his wake. Joyce kept the title of the work a closely guarded secret for many years whilst issuing sections of the work for publication entitled ‘Work in Progress’. The period of composition was the most trying of his Joyce’s life. His health was unstable due to recurrent eye problems and stomach ulcers. He was often enveloped in a darkness of sight, akin to the darkness of the unconscious he was so concerned in trying to articulate. During this period his son Giorgio’s marriage floundered and his daughter Lucia’s mental health deteriorated which Joyce found devastating. Whilst his private life was troubled in public he had become synonymous with the modernist artistic movement and although he lived a life quite removed from the hurdy gurdy of Parisian bohemianism he was famous, if not infamous, as the author of Ulysses. As an artist, he had arrived. Finnegans Wake is a novel written using the dream form as a device to tell the universal story of Everyman, Humphrey Chimpden Earwicker, his wife Anna Livia Plurabelle and their children, twin sons Shem and Shaun and daughter Isabel. It also tells the history of Ireland and the world as well as telling the tale of a river rising in Poulaphouca, Co. Wicklow and flowing in through the heart of the city of Dublin out to meet the ocean in Dublin Bay. The dream form was ideal in that it allowed Joyce the space and freedom to introduce unfettered, myriad strands of material into the language of the night or the unconscious. The novel is divided into four main parts called “books” numbered one to four in roman numerals. These in turn are subdivided into 17 “chapters”. The language of the novel employs multilingual puns, songs, jokes, polyglot portmanteau words, allusions and scientific information, myths and legends. The content is vast. Much of the text is based on or inspired by the eclectic material Joyce collected in his copious notebooks, including fragments of information, phrases and passages drawn from books, magazines, journals and ephemera. Finnegans Wake has earned itself an undeserved reputation for being incomprehensible and unreadable. This could not be further from the truth. In reality it is a challenging work of awesome beauty, into whose inky depths one can probe for years. Its content is rich and varied and also sonorously lyrical. With the correct tools and frame of mind the amazing journey of discovery and revelation that is Finnegans Wake can easily begin. It is a book for the new millennium.